Each person gets a drum. If you want your staff to get involved, there is nothing like Interactive Drumming. Each person participates 100%. Drum Cafe will motivate, inspire and unite your staff or department within minutes. Everyone joins in the pulsating fun and works to common goals, in a very uncommon innovative way. We all have our own beat, Drum Cafe helps synchronize your team in a memorable way - for trainings or conferences. Drumming is a universal expression that transcends all boundaries: personal, organizational or cultural. Drum Cafe teaches staff to increase productivity and efficiency through better team work. Our leadership program has been designed by global Motivation Speakers, HR Consultants, Company CEOs, Leading Musicians and Academic professors. The Fortune 500 companies can’t be wrong. We work vertically and horizontally across companies eg. IBM over 50 team buildings worldwide. BMW 360 degrees training: Sales Staff, Dealership owners, Marketing departments, Factory workers, Customer Service teams etc. This unifying drumming experience creates the perfect platform for teams to experience the power of all working together to achieve a common objective. Break down barriers to create a more open organization. Align to a common goal, mission or vision. Improve Communications through accurate feedback. Accelerate Productivity by motivating staff and getting them to listen to each other. Interactive drumming has never been so effective! Each individual brings their unique sound into the mix to create a one-of-kind percussive orchestra-one that wouldn't be the same without the people who are taking part. This is truly a case of unity through diversity. First, we break down barriers, level the playing field, with an opening of non-verbal communication. Music is a universal language, that allows us in a universal way to break down barriers and transcend the difference among us as humans and individuals. 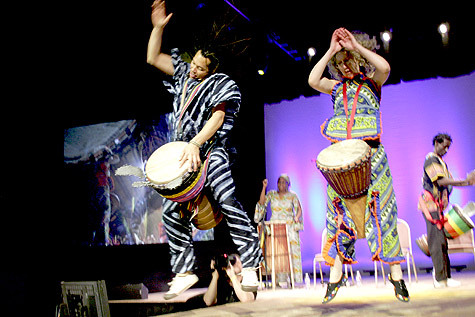 In Africa and in many other cultures around the world, drumming has been used for centuries to bring people together. Second, we align everyone to a common theme through the bass note, the foundation of the music. In every organization, before true success can be realized, there needs to be alignment or some sort. This alignment could be to the vision, mission or values of an organization. We use the power of the bass note, the alignment of the music, as the metaphor for demonstrating the power of alignment with in the group. Third, we explore the diversity, in each and everyone's unique and individual contribution through the tone note. Through call and response we teach the importance of communicating better by accurate feedback. We close off with an interactive high energy percussion set, embracing diversity handing out fun percussive instruments, in an all out celebration of self expression and leadership. This is where we take the drumming skills that we have learned in the beginning to create music. A celebration of diversity, contribution and leadership. This is also a great lesson in leadership. Leadership is about knowing when to play and not to play. When it is time to take a solo or when it s time to support your piers. Through the rhythm, your organization will discover that the whole is greater than the sum of all its individual parts. Turn your company or department into a community. Copyright © 2008 Drum Cafe All rights reserved.